Every cultural phenomenon has its spokesperson and in the century that saw a unique flowering in Italian art, the “cinquecento”, that voice belonged to Giorgio Vasari. A staunch advocate of the panoramic set of ideas we now know as the Italian Renaissance, his Vite de’ piu eccellenti Architetti, Pittori, e scultori Italiani was published and then revised in 1550 and 1568. In his Lives of the Artists Vasari makes and breaks reputations in these volumes. He writes out the bit part players in favour of the big guns, culminating in a hagiography of il divino; Michelangelo. He lays down the law about who is important and who is not in the Pantheon and frankly, he has a lot to answer for. Aside from ‘confabulation’ (a polite word for lying) he writes out Siena and the Sienese painters. The National Gallery’s display tells a story that attempts, and to my mind succeeds, in redressing this egregious oversight. Curator Luke Syson attempts to tell a new story – which he calls “the alternative Renaissance” – and it’s a very compelling one. With loans that have been never made before, the work glows on mellow Tuscan walls of pinks and umbers. Never have the subterranean and often inert Sainsbury rooms looked so good. There are beautiful re-creations of architecture and frames, and happy re unifications of long-estranged panels. 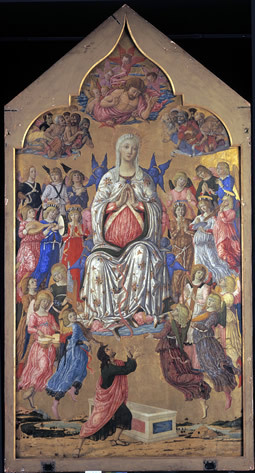 In the great unsung Matteo di Giovanni’s Assumption of the Virgin, c. 1474, (the year before Michelangelo’s birth) the central panel from the National Gallery in London is re-united with a St. Augustine and St. Michael from Asciano and a little Virgin Annunciate from Providence Rhode Island. Paintings made at the same time and scattered to the four corners of the earth come together and palpably breathe a sigh of relief. From Bloomington Indiana to Budapest via Florence. It’s all very exciting. The presiding saint, and Siena’s official advocate in heaven is Santa Catarina, youngest daughter of 24 surviving children of a Sienese cloth dyer. The show opens with the moving, polychrome wood statue of the Saint, commissioned from Neroccio de’ Landi for the Oratorio in Siena. This is a rare loan and so we start off our journey with a firm idea of Siena’s fealties and also her contrarinesses. Siena is a city of factional, rivalrous contrade. The Contrado dell’Oca who owned this statue and whose church was dedicated to their patroness Catherine, reminds us of the famously partisan nature of the proud Sienese. The famous Palio di Siena, that mad dangerous horse race round the central piazza, known as il campo, is still held today, and is probably the most iconic ritualised enactment of the rivalries of the Contrade. So, right away we are in this odd, eccentric little city. For me the great treat are some paintings already in the National Gallery, but newly and wondrously cleaned for this show. Looking at the small panels by the Master of the Story of Griselda (who he? Vasari couldn’t have been less interested, so he has no name) is like looking into an entire world. Men and women, languorous, effete and hugely entertaining, go about their elegant business. From a tale by Boccaccio, and a type of painting known as “spalliere” (possibly because they were meant to be shown at shoulder height over a cassone or marriage chest) they are an antique comic book. Full of detail from animals to tights, they are a delight. I do not share the curators’ bizarre and whimsical fondness for the artist elevated to status of Great in the last room (Vasari isn’t the only one who would like to write certain artists out of the canon!). The 21st century NG curators and our 16th century critic, Vasari himself put forward Domenico Beccafumi, (1484-1551) as a sort of early proto-Mannerist, as the fulcrum of the Sienese Renaissance. These are over–wrought, hallucinogenic paintings reminiscent of execrable post-Michelangelo paintings from the next generation. Weird choice to end the show on. Beccafumi great? Oh well, never mind. I don’t like him but I can’t ignore him. I’m not Vasari. 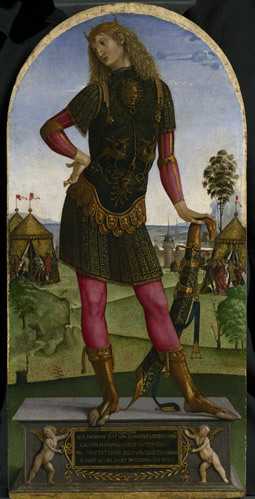 Renaissance Siena Art for a City is at the National Gallery, Trafalgar Square until 13 January. Open daily. Admission £9/£8. £4.50 on Tuesday afternoons, 2.30-6pm.